Seeing as it is indeed Wednesday and I (always) have a ton of WIPs, I thought I’d play along with the other blogs listed on Tami’s Amis WIP Wednesday and tell you all about what I’m working on. In order to not overload my blog with every WIP I have (I don’t think I can even count them all, if we’re being honest), I’ll just list the ones I’ve at least physically touched in the last week or so. I just started this version of my Giving Comfort hat pattern yesterday. Since I sent the originals off for the Afghans for Afghans project, I wanted to make another sample. This time I’m using a 100% alpaca yarn and wow is it soft! Merino wool is crazy soft, but not in the same way alpaca is. It produces such a different fabric: denser, with more drape. I’m interested to see how the hat will turn out when it’s done. It’s been a while since I’ve knit with anything other than wool, so it’s been a nice change. 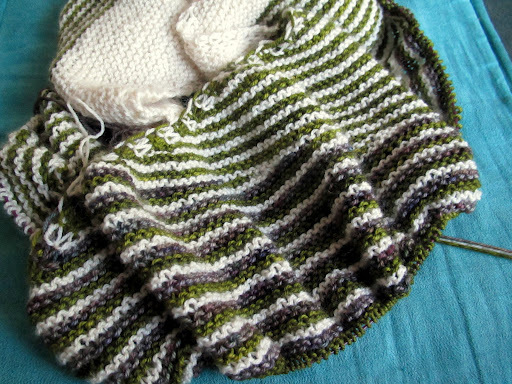 My Color Affection shawl is chugging along. 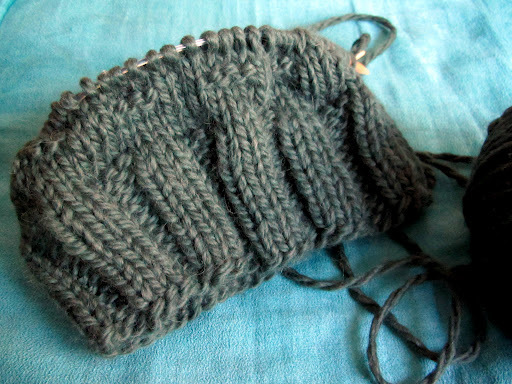 The short rows still feel like they are moving along quickly, which is really nice. It’s easy to see how this design went viral. The pattern is a bit sparsely written, but the design is fairly simple and the results are striking. I’m loving the addition of the third colorway, too. This is my soon-to-be-next sock design. Please excuse its rather tattered look at the moment, I promise it will be pretty. 🙂 Frogging happens! 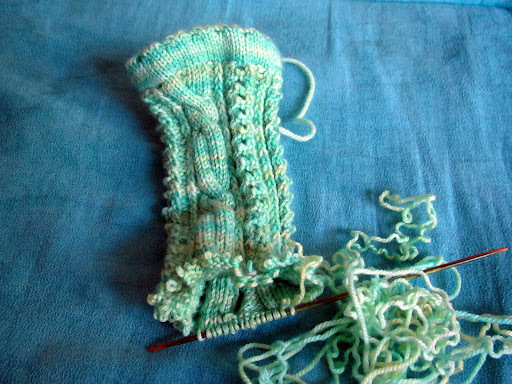 I didn’t like what was going on with the heel, so it had to go. I unfortunately had to run somewhere after ripping back and haven’t had a chance to get everything back on track again yet. No worries, all in good time. I was struck with inspiration for a new design and swatched and frogged and re-swatched like a fiend yesterday after work. I submitted a pattern proposal to Malabrigo Yarns for their Malabrigo Quickies series where they team up with an independent designer and promote a new pattern every two weeks or so. I heard back already: they’re all booked up with designs until the end of the year and will begin thinking about designs to be released next year soon, so they’ll get back to me next month or so. I’m super excited that I heard back already and that they are willing to consider my pattern idea later on, but I fear the suspense might kill me, haha. Not really, but you know. I’ve never been great at keeping the cat in the bag when it comes to things I’m excited about, and I’m pretty excited about this design. I’m also counting down the days until the end of June when I will (hopefully!) hear back about my Knit Picks pattern submission. Is it weird that I get such a rush out of this whole thing, the submitting and the waiting and the hoping? I wonder if that changes as you publish more designs? This entry was posted in WIPWed by shoelaceswitcher. Bookmark the permalink. Man, you are suddenly the designing queen! Good luck with everything, so far I LOVE all of your designs! Oh wow! So many lovely projects, you seriously have been so inspiring! 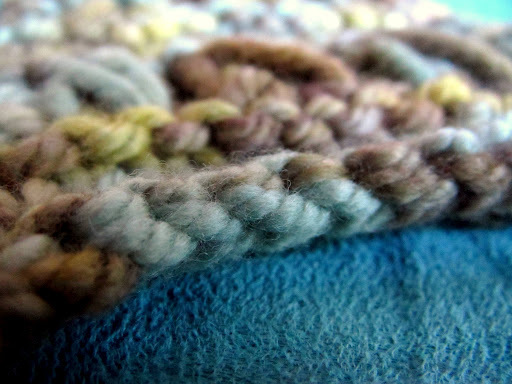 Working with alpaca is especially wonderful, my favorite fiber by far. Fingers crossed on the Knit Picks pattern, they would be silly not to accept you.